For 50 years the Fedorov Institute of Crystallography, Mineralogy, and Petrography at Leningrad Mining Institute has held annual memorial meetings for E. S. Fedorov. 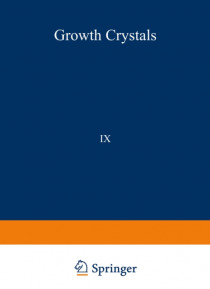 Immediate- ly after the jubilee meeting (May 21-24, 1969), the Fedorov All-Union Symposium on Crystal Growth was held, and the proceedings of that symposium constitute Volume 9 of Growth of Crystals. The symposium surveyed the advance… s made in the USSR in those aspects of growth con- cerned mainly with morphology and structure in natural crystals or closely related artificial ones, work which confirmed their relation to E. S. Fedorov and to mineralogical crystallogra- phy. Crystallography is one of the older branches of natural science but has recently under- gone a striking rejuvenation on account of new methods and new concepts. Photogoniometric methods have been developed in goniometry, while crystal optics has found new lines of ad- vance in electrooptics and techniques in the ultraviolet and far infrared regions. Morphologic studies now use a vast range of techniques, from the hand lens to the electron microscope or cinemicrography. X-ray analysis is steadily becoming more automatic, and fast computers are used with accelerated methods of structure interpretation. Crystal growth is one of the younger divisions of crystallography; previously t it had been of interest only in experimental mineralogy, but now it is an important branch of science and technology with close relations to industry.